Lampanelli told TMZ she's an insult comic and "everyone was having fun"
Lisa Lampanelli is known as one of the hardest-hitting comics in the business, but a heckler got under her skin during a set in San Jose on Sunday night. The comic had what many are calling an on-stage meltdown, and on Monday, fans were demanding an apology and their money back. It all started with a heckler at the City National Civic in San Jose, where Lampanelli first confronted the man then began screaming at the entire audience, fans said. As seen in cellphone video from the audience, the stand-up comedian show quickly turned serious after Lampanelli took exception to the heckler's remarks. The man at one point appeared to hand Lampanelli $100 to "shut the (expletive) up," TMZ reported. 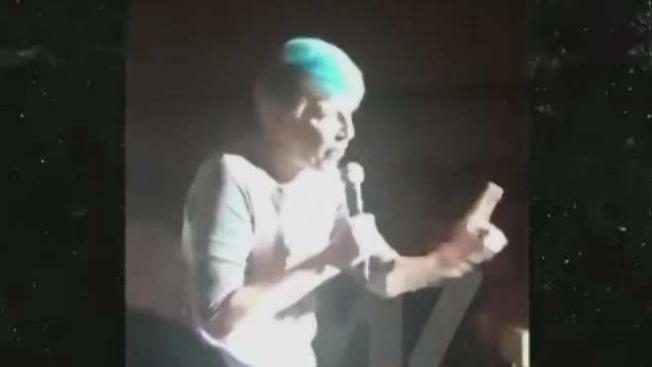 Lampanelli confronted him then turned on the rest of the crowd, some of whom were supporting her, fans said. "One more sentiment of (expletive) from anyone that’s not me or the person I’m talking to, you can get the (expletive) out," she said. She even included the venue and San Jose in her insults. "I’m 56 years old. I’ve been doing this for 30 years," she said. "I don’t need this (expletive)." Lampanelli has been known for decades for delivering deliberately politically incorrect humor and direct insults. While spokeswoman for Lampanelli declined a request for comment to NBC, she told TMZ that the heckler had "totally interrupted the flow" with someone else she was talking to. "I hit menopause and also I hit 56 years old and I said, 'really I gotta put up with some guy yelling at me," she said, adding that, "nowadays more and more people are telling women to shut up. So guess who has to be a bigger mouth than ever?" Fans were more focused on the insults they felt were aimed at them. "It was crazy," Zane Taylor said. "She flipped off everybody, and she said 'San Jose.' It not just us, the audience and all her fan base. It was all of San Jose. It’s like, really?" Many fans felt the bottom line isn’t even what she said but that they paid $125 a ticket, and she walked off early. They said they deserve a refund. "It was uncalled for," fan Danielle Pirslin said. "You don’t pay to get treated that way. ... Bad publicity could be good publicity. I don’t know what her ploy is, but that doesn’t give her any excuse to have a meltdown like that and attack her fans." Lampanelli told TMZ, though, that her shtick is being an insult comic and "everyone was having fun." She figured she would "cut out the cancer and unfortunately the cancer kept growing in the form of this large man who nobody kicked out," she said. "I liked that video, though, because I looked really skinny." A spokeswoman for the event's promoter, the Nederlander Organization, seemed to indicate refunds would not be issued. "Lisa Lampanelli performed a one-hour set on June 10 in San Jose, with comedian Frank De Caro opening the show," spokeswoman Vanessa Kromer said. "Although the show was interrupted by a guest that was heckling her, she did complete her full set."